The Canadian Eskimo Dog is an ancient breed of dog whose history is strictly related to the Inuit people. The Inuit are one of the main groups of the Eskimo people inhabiting the Arctic regions of Canada, Denmark (Greenland), Russia (Siberia) and the United States (Alaska). The Canadian Eskimo Dog is also called Inuit or Qimmiq which simply means dog in the Inuit language. The roots of the Inuit dog date back 4,000 years BP, with the paleoinuit culture, possibly more. From 4000 BP to 800 BP the following cultures developed: Independence I, Pre-Dorset, Independence II and Dorset. However the first identification of sled runners and harness parts was identified with the Thule culture of about 800 BP, indicating that up until that time, these dogs were used more as hunting partners than sled haulers. The Thule Civilization accompanied by their dogs and sleds, crossed the Bering Strait in continuous waves of migration between 900 and 1100 AD. These dogs are extremely versatile and the perfect companions for the Inuit for packing, transportation, hunting and protecting against polar bears. The Canadian Eskimo Dog is extremely strong and he can pull twice its weight through the harshest weather and terrain. This dog was very popular so that In 1920 the population was estimated in 20,000 members, however around 1960, with the introduction of snowmobiles and more modern technologies, this breed started to decline and by 1970 there were just 200 pure dogs. Around 1972 William Carpenter and John McGrath started a project to save this breed giving birth to the Canadian Eskimo Dog Research Foundation, with assistance from the Canadian Kennel Club and the Canadian Government. The first dogs from this project were born In 1986 and registered with the Canadian Kennel Club. Nowadays the situation is complicated and this wonderful breed is still at risk: that’s why we decided to start this project to introduce the Canadian Eskimo Dog to the general public, who has a little or no knowledge of it, unlike other breeds like the Siberian Husky or the Alaskan Malamute. 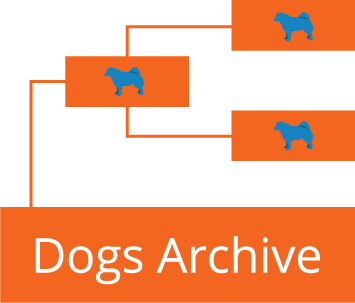 Search the DOGS ARCHIVE to see all the dogs and their ancestors in our new beautiful tree view. We need your help to keep fighting the Canadian Eskimo Dog extinction. What is a Canadian Eskimo Dog ? fgiamma on What is a Canadian Eskimo Dog ? ann harford on What is a Canadian Eskimo Dog ?